The ocellated turkey is a wildfowl found in Central America. 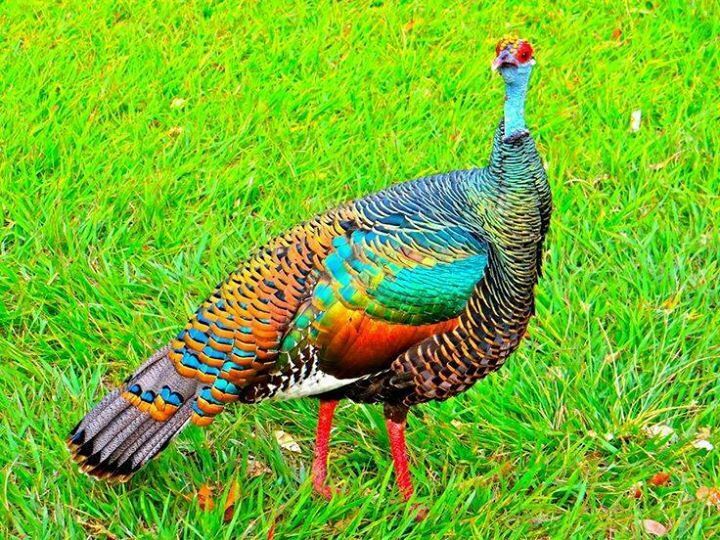 It is a fairly large bird and a source of food for the local population. 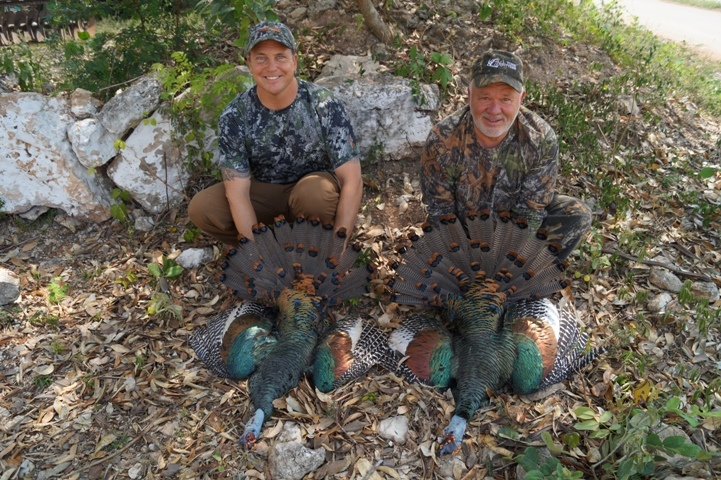 They are also hunted for sport. Size: Ocellated turkeys measure at around 28-48 in (70-122 cm) long. Weight: The average weight for males is 6.6 lb (3 kg) while that for the females is 11 lb (5 kg). 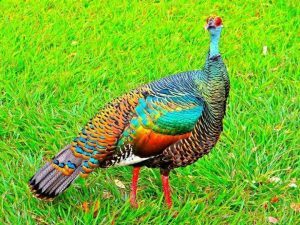 Color: A lustrous mixture of bronze and green feathers on the body, while the tail is blue-gray with blue-bronze eye spots towards the end, and a gold tip. 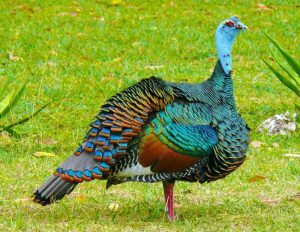 The head and neck are featherless and bright blue in color. The eyes have a bright red skin ring. 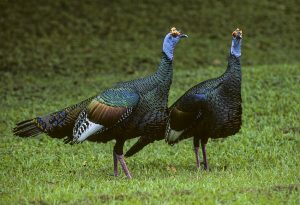 There is a blue crown with orange-yellow warts on the males’ heads. Both genders have a dark red pair of legs. Males have spurs on their legs after they turn a year old. 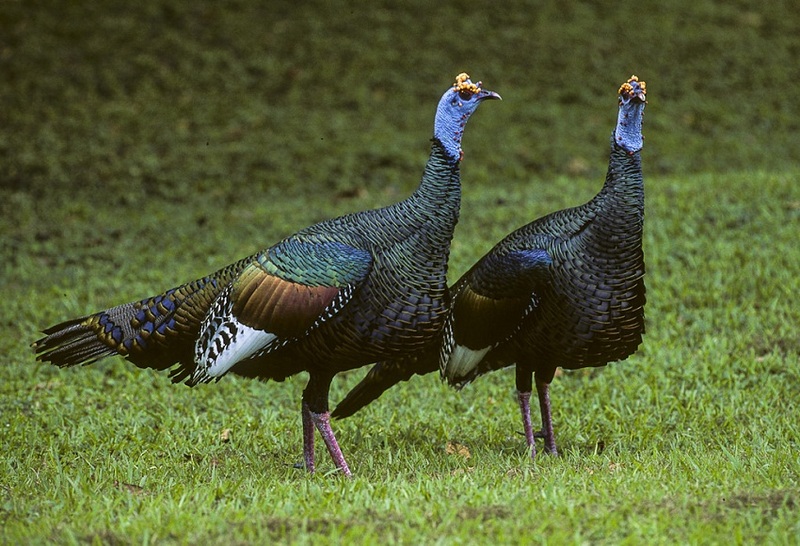 Ocellated turkeys live in the Mexican Yucatan Peninsula, Northern Guatemala and Belize. 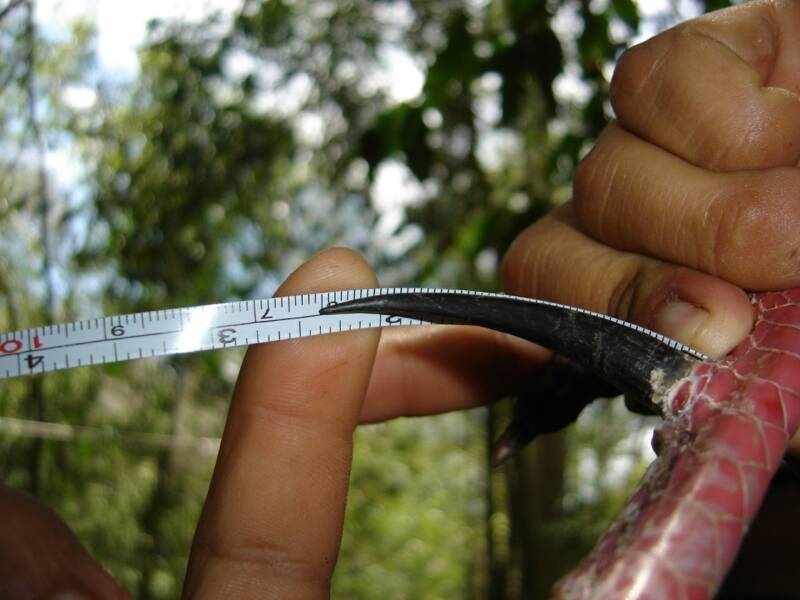 They primarily inhabit tropical deciduous and lowland evergreen forests. 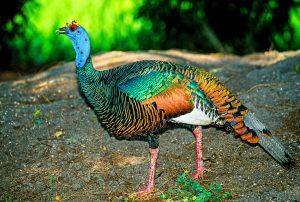 They can also sometimes be found in savannahs, marshlands, mature rainforests and abandoned farmlands. They are diurnal, spending the daytime feeding and the nights roosting in trees. They prefer running rather than flying. They are, however, adept at flying and can do so for short distances. 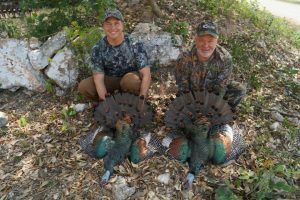 They are social and sometimes can be found in large flocks, led by one particular individual that serves to direct the flock’s movement. The number of members in the flock varies based on the time of the year. 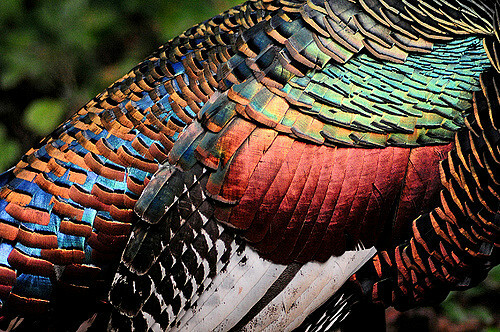 Ocellated turkeys have a generalist feeding habit. Their omnivorous diet consists of nuts, berries, seeds, leaves, moths, ants, and beetles. 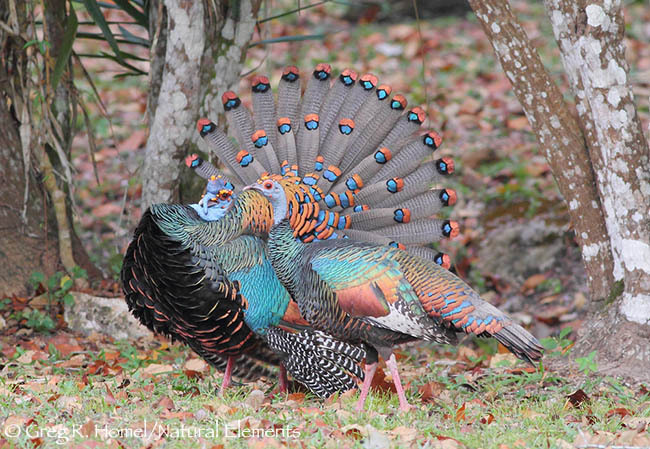 The breeding season for ocellated turkeys falls mostly between late-March and mid-April. 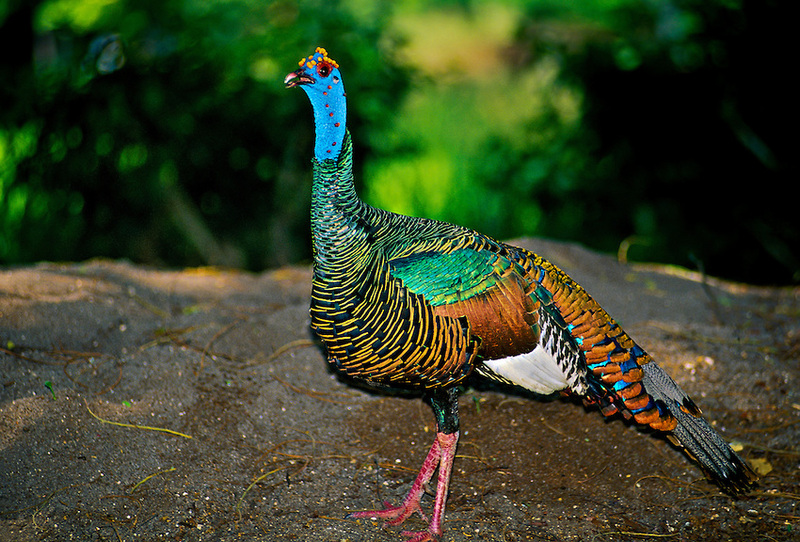 Males grow more colorful just prior to this period and extensively woo females with strutting displays. She lays 8-16 eggs which hatch after an incubation period of 28 days. Females guard the hatchlings with their life. 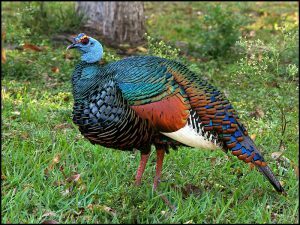 Males usually do not have any parental investment. The hatchlings, for their part, can feed and walk on their own soon after birth. Male chicks reach sexual maturity at 2-3 years of age while females reach the stage after 1 year. 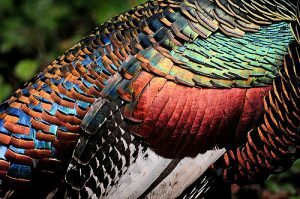 Information regarding the ocellated turkey’s lifespan is insufficient. Male ocellated turkeys have been known to make drumming sounds with a low frequency, and a high-pitched gobbling sound. Both sexes make a nasal cluck-putt sound that informs others of their location. They increase the sound of this call to communicate an alarm. They can regulate their body temperatures by remaining sedentary and in shaded areas during the heat of the day. They are often preyed upon by ocelots, margay cats, jaguars, jaguarundis, coatis, raccoons, snakes and birds of prey. The IUCN lists the ocellated turkey under their ‘Near Threatened’ category. 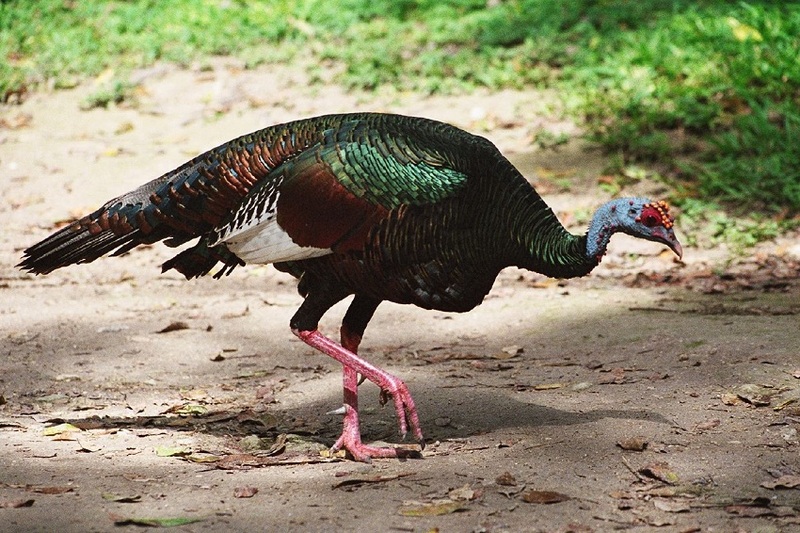 They are a close relative of the wild turkey found in North America.